Sécheron’s RTP100 traction protection relay monitors traction parameters like voltage and current in AC or DC rail vehicles and protects traction equipment from short circuits, overcurrents, and unsafe catenary supply voltages. It can be delivered alone or with Sécheron AC and DC circuit breakers and voltage and current sensors. 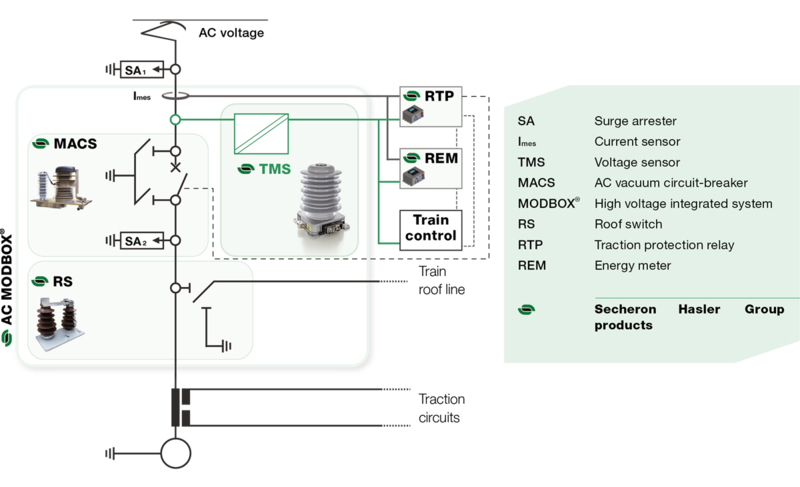 Sécheron’s RTP100 traction protection relay is a multifunctional programmable device to monitor traction parameters like voltage and current in AC or DC rail vehicles and to protect traction equipment from short circuits, overcurrents, and unsafe catenary supply voltages. If the parameters measured exceed the thresholds set, output relays connected in series with the main circuit breaker control circuit will be triggered, protecting the vehicle and passengers. The RTP100 can also be coordinated with the Traction Control & Management System (TCMS) to detect the vehicle supply voltage. Users can easily configure the device using dedicated software. The RTP100 can be delivered with other Sécheron electrical safety components like AC and DC circuit breakers and voltage and current sensors. DC applications 600VDC, 750VDC, 1.5 kVDC and 3 kVDC. 4 AC/DC analog inputs for voltage/current sensors. Analog inputs: unipolar, bipolar or Offset types. 2 N.O output relay contacts. 4 changeover output relay contacts. Output relay contact rated 8 A.
Auxiliary supply voltage 24 to 110 VDC. Embedded electrical transient recording functionality. Reference standards for programming language: IEC 61131-3.